Timely. Prophetic. On the cutting edge. In Restoring the Christian Family, the Sandfords confront the issues facing families today with sound logic based on scriptural truth. In-depth insights from more than thirty years of counselling experience combine forcefully with helpful illustrations from the author's own family life, providing practical wisdom for every reader who is concerned about his or her family. Restoring the Christian Family helps to fulfill the prophecy of Malachi 4:6 - "And he shall turn the heart of the fathers to the children, and the heart of the children to their fathers." 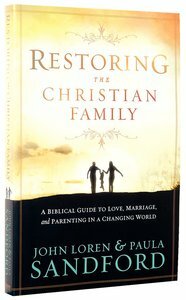 About "Restoring the Christian Family"
JOHN AND PAULA SANDFORD travel worldwide conducting seminars interdenominationally on marriage and family, inner healing and transformation, prayer, the gifts of the Holy Spirit, burden-bearing, intercession, and more. They make frequent television appearances and are active in the renewal and reconciliation movements. John and Paula live in Hayden Lake, Idaho. Paula Sandford is cofounder of Elijah House ministries. Throughout the past fifty years, she has ministered to countless number of people in the areas of inner healing and transformation as an ordained minister and counselor. Many around the world consider her to be their personal counselor and spiritual mother. With her husband, John, she has coauthored more than twenty books. Paula and John have been married for over fifty years. They have six children and many grandchildren and great-grandchildren.